Hi Kathy! I can't decide which is more beautiful, the quilt or your scenery. Absolutely gorgeous -- both of them! I love how the use of the white really brings out the coloured fabrics, they just bounce off the background! I would love to be in your mind's eye, to see what you see when you look at a quilt top. Your quilting always inspires me. Have a great wkend! Simply stunning. It's a great quilt but you quilting just pushes it over the top. I hope some day I can quilt like you, very inspiring!! Wow, der Quilt ist ja ein Traum. Love the patchwork design - is this an actual pattern ? This quilt is near to perfection Kathy! 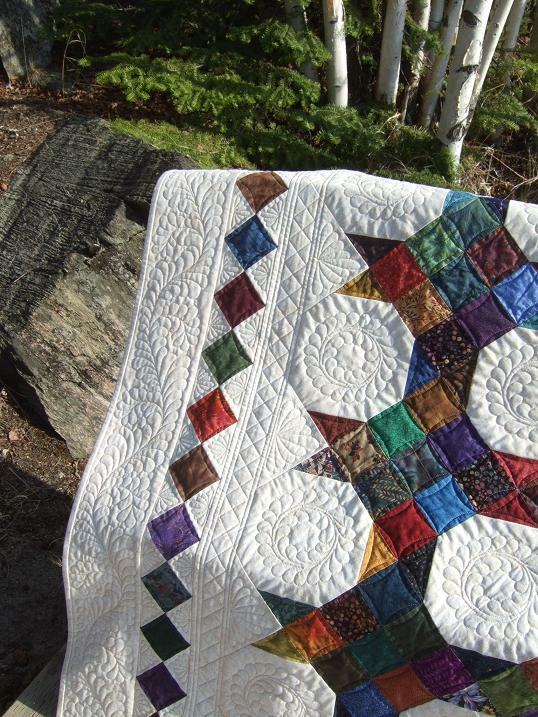 Everything about it is fantastic, the quilting..the piecing..the colors..beautiful!! Fantastic Kathy. 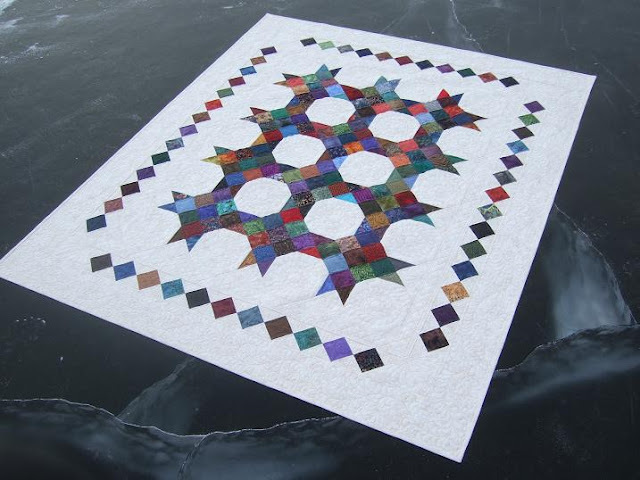 The quilt pattern and the fabrics you chose I love but when you add to that your AMAZING quilting it goes to a totally new level. Love the photo spots especially the one with the cracks in the ice. fabulous quilt and quilting. The photos and scenery are just gorgeous. Love the simple striking effect of the quilting on white. Beautiful job. One of my favorites so far. Not being a fabulous long arm quilter like you are, those quilts with big open spaces scare me! Wow, what a lovely, lovely design you came up with--love the quilted border and all the feathers. Great photos! 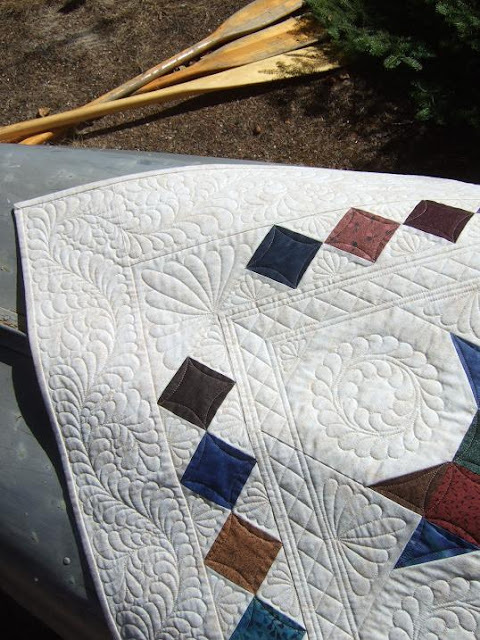 Thanks for sharing your quilt's story. What a fantastic quilt! 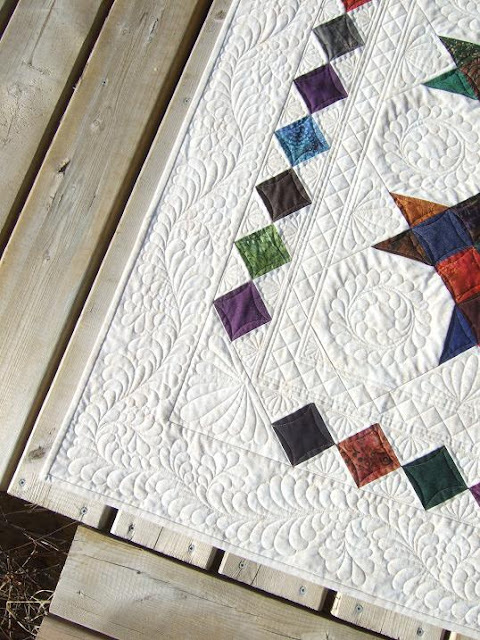 Your quilting is amazing, I have been trying so hard to do feathers, but I'm hopeless at it! 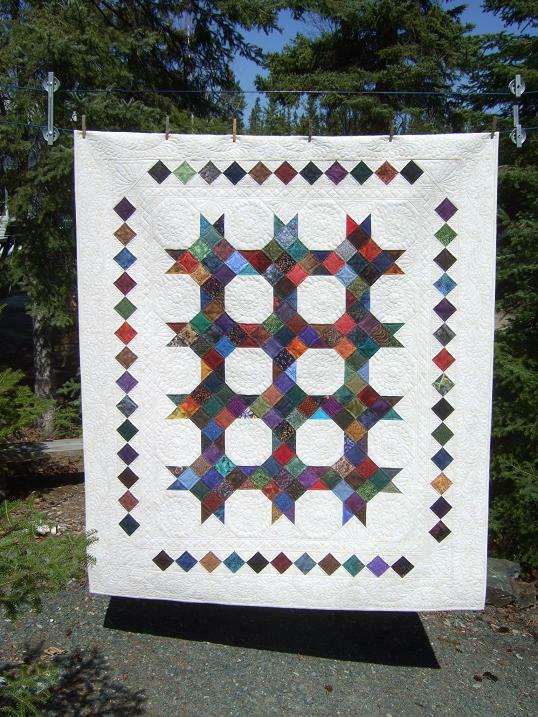 Kathy,this is one of my favorite quilts you have done - just lovely! Absolutely fabulos. Thanks for sharing. Fabulous quilt set off by amazing scenery. Take care. Fantastic quilt and quilting. SO pretty to look at. 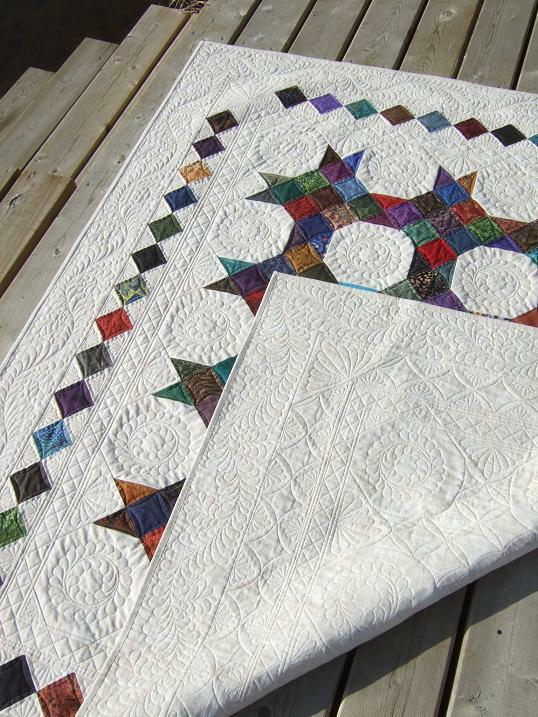 So beautiful and your quilting, as always, is stunning. 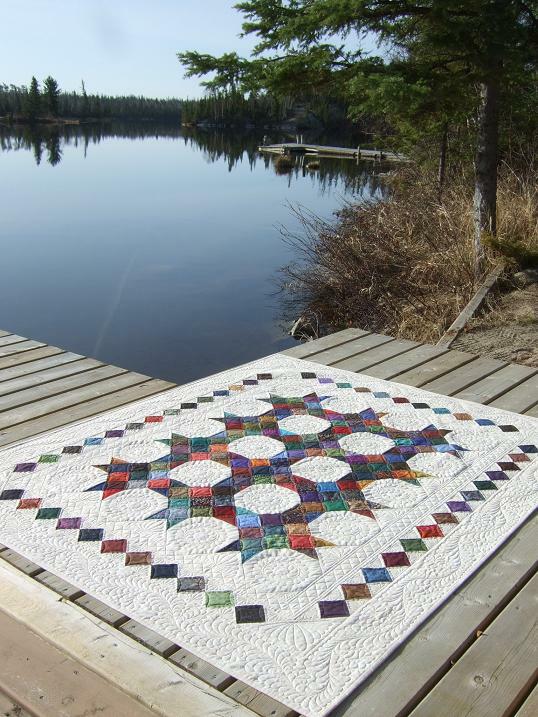 gorgeous quilt and quilting and scenery!!!!! love it on the frozen lake!! Lovely quilt and your quilting is amazing! I love the photo of it on the dock. You are brave to lay a white quilt out in nature! Wonderful quilting and photography! It's a beautiful quilt, thanks for sharing it. 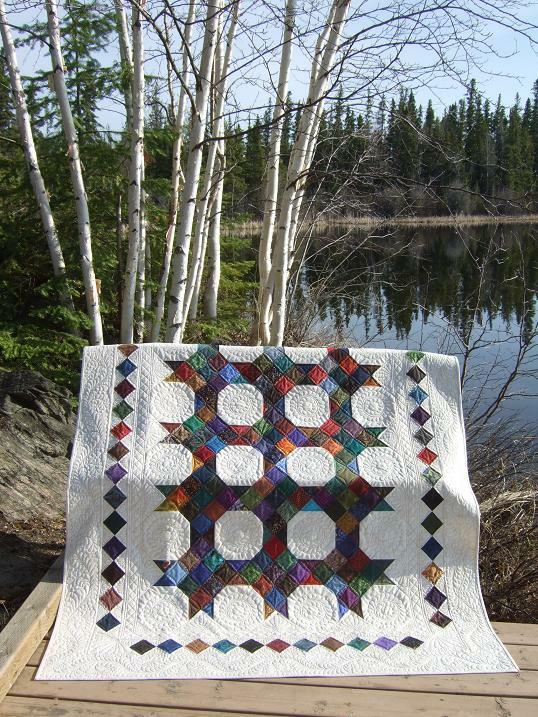 It's stunning and so is your quilting - wow! Beautiful quilt and the quilting is amazing. Thanks for sharing.